The Republic of the Union of Myanmar – or better known as Burma –happens to be located in the southeastern region of Asia, and it's considered the second largest country in the continent. The capital city, Naypyidaw, is located in the center of the country, and even though it's quite new, it's quite a busy place. For many years, locals were asking the government to build a road between the capital and Rangoon (which was the former capital). Finally, in 2009 they opened their first main road that was supposed to be built following international highway standards. Unfortunately, it has turned into Burma's Highway of Death. Burma's Highway of Death was not supposed to turn out so bad. With its wide eight lanes, it was supposed to be pride of Burma. Certainly, it was quite clean and beautiful when it first opened, but as time went by, more accidents started to occur. In addition, there was a lack of accident areas on the road, making it difficult for the drivers to rest on the side of the highway as they waited for help. Moreover, the area is so isolated that there is barely any cell phone signal to call for help. 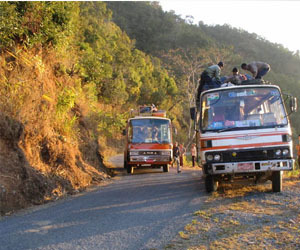 Burma's Highway of Death was supposed to be a great road because it cut down the travel time in half. Nevertheless, statistic showed that just after one year of its inauguration, 80 people had lost their lives on this highway; consequently making it the highway of death. The road between Naypyidaw and Rangoon promised to be just about the next best thing in Burma. There wasn't much traffic, the road was well-maintained due to the tolls drivers paid, and it was supposed to follow international standards. Some might wonder what went wrong and how did it become Burma's Highway of Death. It all seems to indicate that the highway safety simply failed, and the creators were oblivious to the consequences that this would bring. Among the victims of the Highway of Death was the grandson of the Mayor of Rangoon. There are a few people, though, that attribute partial responsibility to the mechanics that work on the vehicles. The lousy mechanical repair that shops perform in Burma has been an ongoing problematic, and many people believe this has contributed with the accidents on the Highway of Death. It has become rather difficult to obtain the reports for 2010, but many believe that these numbers are actually higher. On the other hand, the authorities have been accused of hiring contractors that had no experience whatsoever building a highway of such magnitude. In addition, they say their main goal was to build the road the fastest and cheapest way possible. They didn't take the time to realize that they were building Burma's Highway of Death.